Don't mess with Texas. That means you, Bugatti. There was some controversy a few years ago when Hennessey claimed its Venom GT beat the Bugatti Veyron to become the world’s fastest production car. While Bugatti disputed this, the fact remains that Texas-based Hennessey isn’t afraid to challenge one of the world’s most exclusive brands. And it plans to do that once again with its upcoming Venom F5 hypercar. Hennessey has just announced that later this year, the Venom F5 will debut, and it’s named after the fastest and most powerful wind on Earth, the F5 tornado. How fast will the Venom F5 go? F5 tornados have winds speeds measured between 261 mph and 318 mph, and Hennessey notes the car’s top speed will approach 300 mph, but we think it’ll exceed that. 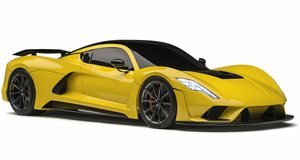 Unlike the Lotus Elise-based Venom GT, the Venom F5 will have its own unique chassis and design, and will be even more powerful with improved aerodynamics and an ultra-light weight build. Hennessey Special Vehicles, a new company established specifically to design, develop, build and sell the car, is located next door to Hennessey’s tuning shop and quarter-mile dragstrip testing ground. "F5 will be exceptionally American and built in Texas," said John Hennessey. "We look forward to sharing more details about our special hypercar very soon."